If you have an online store, you know it’s never too early to start planning for the holiday season. Well, maybe March would be too early… But with Christmas shoppers starting earlier every year, and Christmas decorations appearing next to Halloween candy in many stores, now is actually the perfect time to get your store in the Christmas spirit. Whether you’re a seasoned salesperson or this is the first Christmas in your online shop, we’ve got the tips you need to get everything spruced up for the holidays. When you type your address into a website and click “buy,” you’re likely making that decision because the e-commerce website looks trustworthy and reputable. You’re confident that you’ll get the product as described, you’ll be charged the correct amount, and that your email address isn’t going to be sold to any mysterious royalty who need your help recovering their fortunes. Use a custom domain. A custom domain (website address) is a sign that you take your business seriously. It also shows that you have it together enough to actually set one up. While JimdoFree sites can always use the Jimdo subdomain (mywebsite.jimdo.com), if you want your customers to know that your business is the real deal, it’s worth getting a custom domain attached to your website. A custom domain is included in both JimdoPro and JimdoBusiness. Provide testimonials. Word of mouth is a powerful motivator, and an important way to build trust in your brand. If you have happy customers, ask if you can feature them on your website. You might share a photo of them on your Instagram feed, or put a photo and a quote from them on your homepage or on different product pages. If you’ve been featured in any press articles, add those as well. Complete an FAQ section. Customers may skim over your e-commerce website’s fine print, but they are more likely to read a good frequently-asked-questions section. Here you can lay out who you are and what you do, set out your store’s policies, and answer common questions. An FAQ section is also a chance to let your personality and sense of humor shine through (since you get to make up the questions). For a good example, check out the tongue-in-cheek FAQ page on Jimdo website SammyRose. An FAQ page like this one from Jimdo website Bobsmade helps customers find the information they need—and will save you time too. By putting a Store Item Element on its own page, you can add additional photos, videos, sharing buttons, and more. You can put more information about your products on each page, which can help increase sales. In addition to the Store Item Element, you can add more text, photos, galleries, videos, testimonials, share buttons…basically any element you want. The more information you can provide, the more likely your customers are to click that beautiful “Add to Cart” button. You get a unique URL for each product. When you create a new page for each product, you get a unique web address to match it (e.g. 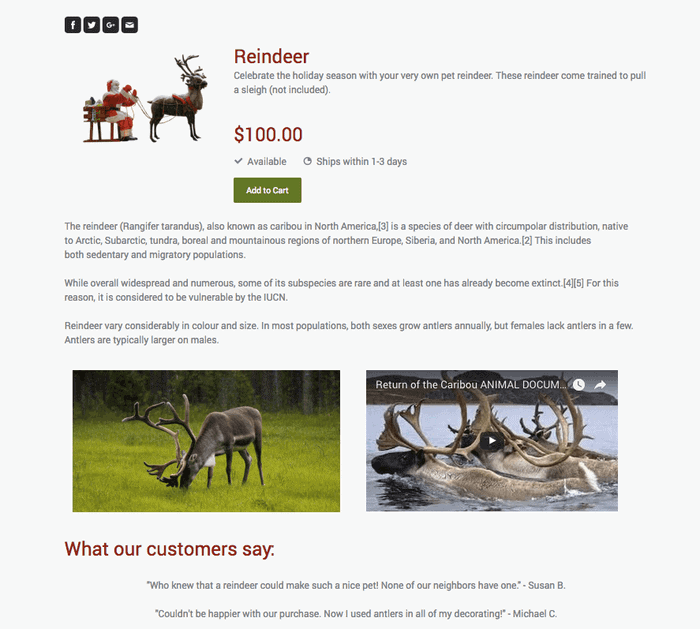 mywebsite.com/store/santas-reindeer). This makes it easier to share or promote individual items. You can cross-promote products and encourage more purchases. Put a Store Catalog Element on each product page with similar recommended items. This way, customers will see other related products that they might also be interested in. An example of a Store Catalog Element showing recommended items from Jimdo website BlackYeti. The added content will boost your SEO. The unique URL, added text, and information, plus the ability to fill out your SEO settings for each page, will all make it more likely that your store items will appear in people’s Google search results. Remember that you can post up to 15 store items with JimdoPro, and you have unlimited products with JimdoBusiness! (And, as always, Jimdo never takes a transaction fee). As an online store owner, you know your products better than anyone. For the holidays, help your customers by curating gift guides with some common categories (gifts for dads, gifts under $50, housewarming gifts, etc). To create an online gift guide, start by tagging your products for the guide you want to use (for example, tag your Store Item Elements with giftsfordad or giftsunderfifty—and remember that tags can’t have spaces). Then add a Store Catalog Element for each tag, and the gifts you’ve selected will appear. Try putting a few different Store Catalog Elements on your homepage, and visitors will be greeted with easy buying guides right from the start. Ok, you’ve set up your store to look its best—now how can you turn people who are browsing into people who are buying? Customers love to feel like they are getting a good deal, and with holiday sales and promotions becoming the norm, discount codes are a good way to compete with other shops. With JimdoBusiness, you can create a discount code specifically for the holiday shopping season. Set the date on it to expire right after Christmas, and even set a minimum amount that people must spend in order to qualify for the discount. To start with a discount code, go to your menu and click on Store > Discount Codes. Another idea is to offer a discount code specifically to people who have just made a purchase, in order to encourage repeat business. Create a discount code like “thankyou” and add it to your customized Order Confirmation page (also available with JimdoBusiness). It will be a nice surprise for your customers and will help increase brand loyalty. Like Hansel and Gretel eyeing the gingerbread house, free shipping is hard for customers to resist. In study after study of consumer behavior, online customers actively seek out free shipping, will spend more if it means qualifying for free shipping, and in many cases actually prefer free shipping to percentage discounts. Don’t want to offer blanket free shipping across your online shop? No problem. With JimdoBusiness, you can use tag-based shipping to offer free shipping on select items. For example, you could add the tag “christmas” to some store items, then set a tag-based shipping rule to have only these items shipped for free. If you’re nervous about the cost of free shipping, just remember that you can always set it so that customers must spend a certain amount before qualifying. If you have JimdoBusiness, you can use the URL redirect feature to create custom “vanity” URLs. For example, instead of sharing a long link like mystore.com/store/clothing/holiday-sale you could create a simple placeholder URL like “mystore.com/secret-santa” and have that forward people straight to your Christmas offerings—without needing to permanently change any of the URLs or pages on your website. These short vanity or promotional URLs are also much easier to use on printed materials and in social media posts. Christmas can be a stressful time of year for shoppers and store owners alike. But a little investment in time now (while you’re enjoying your Halloween candy) will make the season easier and more successful for your online store.